The definition of SuperTall has “grown” as the sky is, increasingly no longer the limit. SHoP Architects has just passed the threshold into the SuperTall Club. 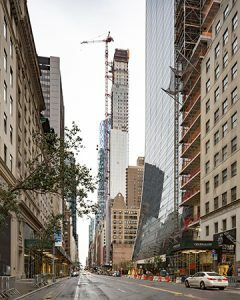 DEZEEN (linked) writes that 111 West 57th Street, the 43-foot wide plot will rise 1,421 feet toward the sky. Due to the aspect ratio of height to width, this building has the distinction of being the skinniest development in the world. This still has months to go before it is “topped-out”. The final height will fall under 1,969 feet…a distinction which keeps it from being classified as MegaTall according to the Council on Tall Buildings and and Urban Habitat.